One of my best friend's daughter just had a birthday. She asked me not to spend a lot on gifts, so I decided to give her something that would be just for her, and fit into a budget. Since her mom was with me that day (she graciously helped me go shopping since I still couldn't get around well on my own) she helped me pick some things her daughter would like. I chose a color scheme and set out to find things that I could use as gifts. 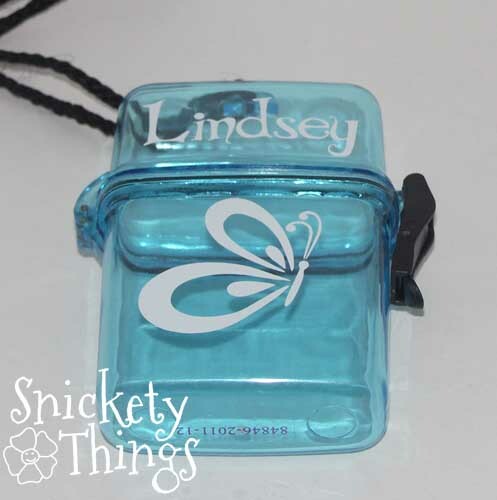 Lindsey really likes this color blue. My first stop was Michael's where I found some inexpensive items in the summer collection (which means clearance!). I found this key case. It had a sticker on it, but I pulled it off and added something just for Lindsey using my Silhouette Cameo and some vinyl. I also found this water bottle at Michael's. It already had the print on it so I just put her name in vinyl over the design. My next stop was Dollar General where I found this nice acrylic tumbler. It just begged to have a design put on it, too. 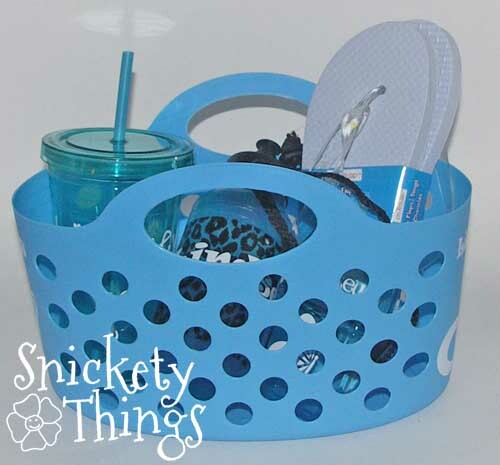 Over at Dollar Tree I found this great basket. I put her name on the side of it. Here is everything in the basket. I didn't have a separate picture, but I also put a pair of white flip flops in. I wrapped everything in the basket with white tissue paper and used the basket as the gift bag. I spent less than $5 on everything you see there, except the vinyl. If you don't have a cutter and vinyl, you can always buy sticker letters and designs in the scrapbook section. 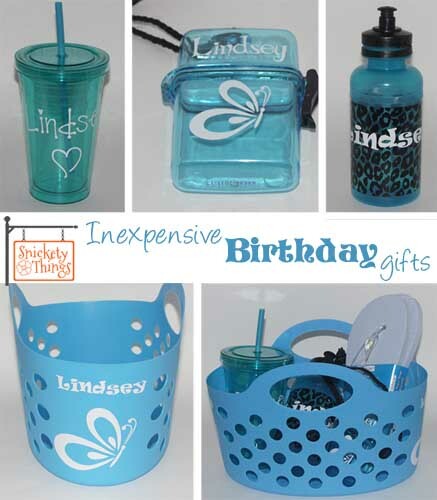 It makes a great personalized gift. 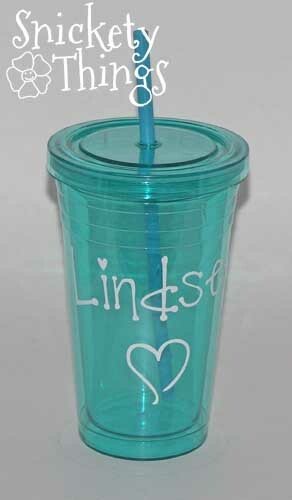 I didn't stop just making the gift for Lindsey, I also quickly cut some letters for water bottles for my girls. Now that school has started it was requested that we send bottles of water labeled with their names for use at recess and snack time. 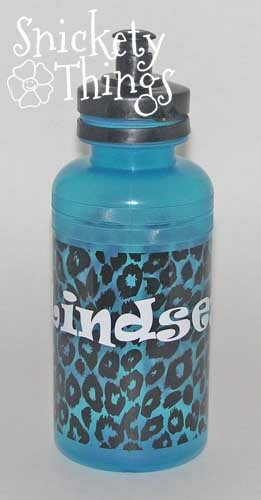 We didn't want to keep buying bottled water, so we went with this much cuter way of sending water with them to school. I picked school colors to let them show a little school spirit. 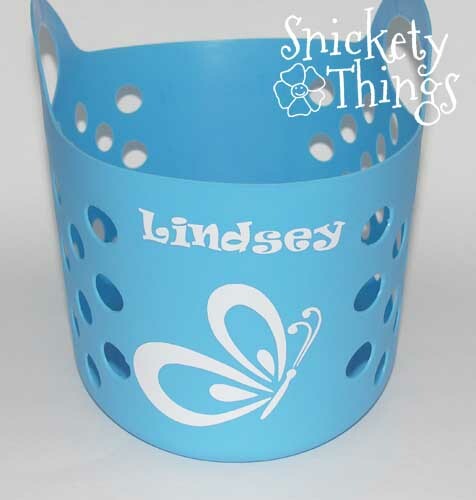 Do you have creative, inexpensive gifts you have made? Thank you, I went with the school colors and mascot for these. She did like it. She used the key holder to hold all of the gift cards she got. Thanks for stopping by! What a great and personal gift! I would love to receive something like that! I glad you like it! Thanks for stopping by! These are neat! I want to put labels on everything with my Silhouette now. Will the vinyl stay after washing? I assume you just need to be careful and not put in the dishwasher. I used outdoor vinyl that can withstand washing, but not the dishwasher. It is not the same type of vinyl that you use to put on your walls. That's a really cute idea! I'm always trying to find inexpensive gift ideas. Glad you found it useful! Thanks for stopping by.